Anyone have one? A Glock 20 or 20 SF? Heard more snappy than .45, but less than .40 Glocks. Liking the 10mm round? How would a longer cased 10mm be less snappy than a shorter cased 10mm? Is that the case? Does the 10mm Glock have a more manageable recoil? I have a 20. Depending on the ammo it definitly have more snap than the 21. For me, the 10mm feels like more a kick, and the .45 more like slower push. I have 8 (ie G20, G20SF, G29). GSSF, has been very kind to me. I prefer the 10mm cartridge & the Glock platform; but, I reload everything I shoot out of them. IMHO...it depends on which ammo you use. I carry the early Colt Delta Elite, Gold Cup. When I first got the sidearm I was shooting the very fast 155 grain ammo that was being pushed at around 1400fps. It was not easy for me to control the weapon due to my small stature and hands. Went to the 180 grain that was slowed down to around 1250fps and it helped some in my case. Both of these rounds kept hitting high on the target by 6-7 inches when shot through my brothers regular blued Delta with fixed sights. Then I found "the" round for it. Hornady's 200 grain JHP/XTP that is pushed at 1150fps immediately calmed my 10 down and dropped the point of impact right on top of my front sight post and my brothers also. The best thing about it now is that the weapon is easier to control than my full size Kimber .45 acp. Just one guy's .02 worth. Hope it helps. P.S. I absolutely love my 10mm by the way. The G20 for my was more "snappy" than say a G21. The bigger question is can you actually get 10MM ammo for it? It's also a bear to conceal which is one reason I got rid of my G21. I slimmed my Glocks down to 9MM and .40. Actually, during every panicked buying period for ammo that I have experienced in the past 20 or so years, I have always found ammo for my 10mm when you couldn't find 9mm, 45acp, .22 of any kind, etc. This last scare we had (November 2012 time frame) I bought 400 rounds of Hornady from Natchez at $16 a box of 20. They had something like 200 or so boxes in stock at the time. It was the only ammo that they did have in inventory at the time. Before that Midway for $14 a box in Nov 2008 (same scenario). I think it is due to the 10mm not being a popular round with shooters due to the "kick" of the round when they use the lighter and faster grain rounds. If I understand correctly that is why the .40 was developed. That's OK with me. I'll take the 200 grain JHP/XTP over the .40 cal for ballistic purposes and its availability of being there during panicked buying scenarios. Just sayin' my opinion only. Slide mass. The G20 Slide has significantly more steel/weight than the G22....and yes, I believe it does. But, I also have large hands. There is also an internal ballistics difference (ie case volume) between the 10mm & .40 S&W cartridges; which, has to do w/pressure. Subjectively, the 10mm produces more of a "thump"; while the .40 S&W has a "snap"
Similar, to the different feeling of a .45 ACP & .45 GAP. Most guys’ hand load these up or down depending on intended usage. I understand that the G20 makes a good hunting handgun. I have heard of bears being taken with hot 10mm loads. I suppose its possible; it can be loaded up close to a .41 mag. Has anyone here taken large game with a 10mm? Here is a picture of Glockzilla a 10mm custom Glock longslide set up for hunting. Mod 1 did the work. I'm seriously considering selling my .357 USP Compact and getting a Glock 10mm for fall/winter/spring carry and then a pocket 9mm for summer carry. I'm not crazy about the double action pull of the USP- my first round is usually off during a quick draw, but never had an issue with Glock accuracy. Has anyone fired the compensated version of the 10mm? Does the muzzle blast make ridiculous? How about reduction in recoil? I suppose its possible; it can be loaded up close to a .41 mag. That's a "little" bit of a stretch. Out of a standard length KKM G20 barrel I have reloaded hunting/carry ammo: 180gr XTP @ 1350 fps, 200gr XTP 1250 fps, 155gr Barnes @ 1400 fps, 200gr WFNGC @ 1300 fps. I took 2 hogs and a doe, using a 10mm Glock, this past hunting season. I have a G20C & 2 other KKM comped Glock 10mms. I don't perceive any "muzzle blast". That design does reduce muzzle lift; though, not as effectively as some of the end of barrel comps out there. "Generally" speaking, a comped "nuclear" 10mm round, feels like a hot 9mm round. In closing, I'm a little passionate about this pistol cartridge & Glocks. I've done a lot of experimentation w/: reloading, competing, hunting & terminal ballistics testing. That being said, it ain't magic. There are a lot of people doing similar work w/different cartridges & pistol platforms; having, similar success. ...and given the situation/opportunity, I'd choose a semi auto rifle cartridge platform or a 12 gauge shotgun, if my life or someone else's depended on it. That is one of the finest Glocks l have seen. How did you mount the reflex sight? I've always thought having one mounted on my work gun would work well. 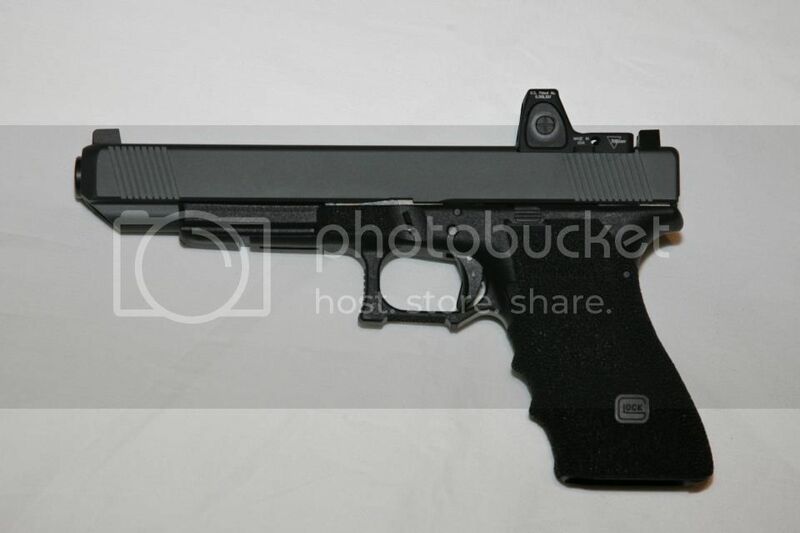 I can't modify any of my issued G22's but would be willing to pick up a new one or have that done to my 35. This Glock is not mine. I have a somewhat different one done by the same guy. His name is Pike Spraggins he's a retired SWAT Officer and now he customizes Glocks and is a professional 3 gun shooter. You can find him at Mod 1 on facebook or at http://mod1firearms.com, most of his content is on facebook. They use high supressor sights when they mount the red dot. This way if the dot goes away you still have sights. 10mm best handgun round ever made hands down. I agree, love the 10mm. unammo.com has a 1000 round case of 10MM for 515.00 delivered.